Roughed out body geometry. Drank too much coffee. Organized parts for export and uploaded to ftp. Finished model. 19K triangular polygons. Decided to put off gunner, but will complete if necessary. Estimated time remaining until completion: 5-6 hours. I think most of the texture work is passable. It has a 2K texture map and I added added a few more pieces, briging the total polygon count to just under 20K tris. Finished uvs. Will start building textures tomorrow. Should be completed by Thursday night. Working on textures. Had difficulty figuring out panel lines, but making progress now. Trial and error put me back a couple of hours but I'm still aiming for completion tomorrow night. Finished most of the body work. 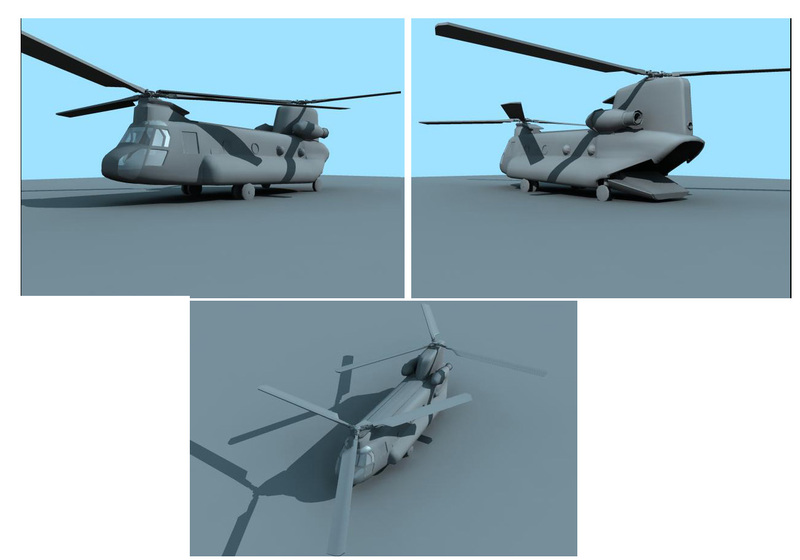 Will most likey finish the model tomorrow and then begin texture work. Going to spend most of the remaining modeling time on the prop-assembly. Estimated time to completion: 4-5 days. It's a weird looking chopper. I'm shooting to get done by this weekend. Mostly done with the modeling. Will start uvs and textures tomorrow. Finished uvs and started started textures. Spent time on the model today. Still need to do the back door area and mounted gun. Started blocking in the vehicle. Worked on it some more this morning. Modeling mostly done. Will start uvs and textures next week.